With the season over, and the draft still more than two months away, we like to use this time to look back at the recently completed season. Specifically, we offer up a statistical look at how the Steelers performed in a raft of categories compared with the rest of the league. Over the next week or so we will post a chart and brief analysis of just how the Steelers really did. We begin with points scored, and the news is not good. For only the third time in the past nine seasons the Steelers scored fewer points (347) than the NFL average (352.47) and 46 fewer points than during the 2007 season. The biggest difference between this season and those other two (i.e. 2000 and 2003) is that this season the Steelers made the playoffs. 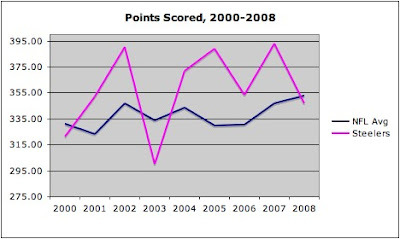 Indeed the 2008 season was their best by far of those in which they scored beneath the league average (in 2000 they were 9-7, and in 2003 they were 6-10). Moreover the 2008 Steelers have the third lowest points scored total of Super Bowl champions during the last nine years (inclusive). Only the 2000 Baltimore Ravens (333 points) and the 2002 Tampa Bay Buccaneers (346 points) scored fewer. Stay tuned throughout the next couple of weeks as we take an in-depth look at the offense and defense of the 2008 champions of the National Football League!